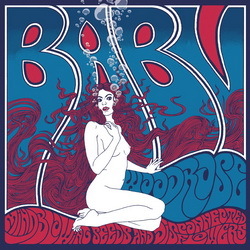 I have always felt that the blueprint for the soul and spirit of Baby Woodrose is really within these very first recordings of my own, so it feels great to finally have them on vinyl and I hope some of you can appreciate the beauty of these rough diamonds. I have picked out 15 tracks, many of which also ended up on the album in final versions, but two of them were released separately under the alias Disconnected Flowers on a 7” which is virtually impossible to dig up by now and a few are previously unreleased. Polishing these tracks proved a thankless task, but luckily I still had most of the original master cassettes and the original tape machine, so this album is basically a 24bit digital dump and a careful remix of the stuff I think is the most interesting”. Originally released April 25th, 2011 on LP/CD and as download. The LP is now deleted and the last CDs are sold through the Bad Afro Recordstore.